Hello! It's Fawny Holiday Week over on the Lawn Fawn Blog! It's a whole week filled with holiday cheer and inspiration to jump start your holiday crafting. 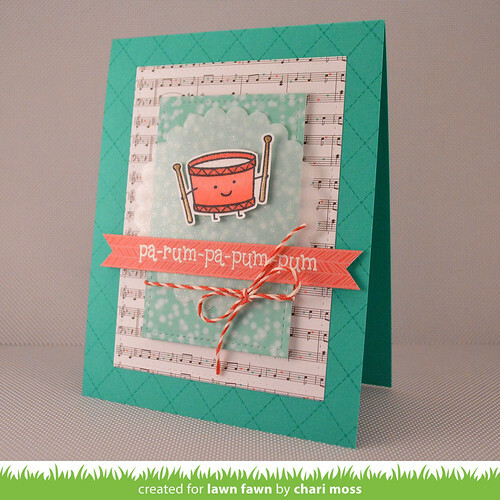 Today I have a project to share using the new Snow Day papers along with an older holiday stamp set Pa-rum-pa-pum-pum. I used the stitched rectangle dies to cut and layer some of the papers from the Snow Day Petite Paper Pack. 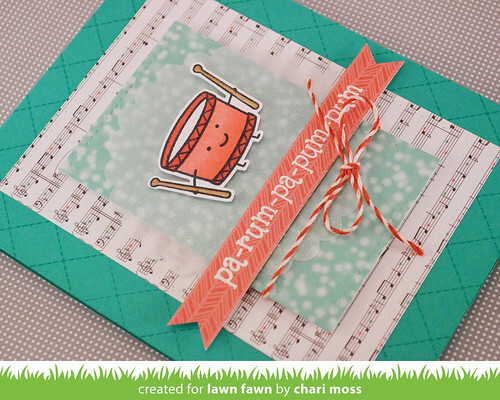 I picked the music paper because I thought it was appropriate to go with the cute little drum and I just love the snowy pattern too. I cut a scalloped circle from vellum and sprayed it with Glitter Dust spray to give it some sparkle and layered it behind my drum. I used Argyle Backdrops on my Candy Necklace colored card base. I finished it off with some Peppermint Lawn Trimmings. I added a bit of gold Wink of Stella to the drum sticks and clear Wink of Stella to the rims of the drum. Even cute drums need some sparkle too. Be sure to visit the Lawn Fawn Blog today and all week long for more projects from the Design Team as well as girls from Lawn Fawn Headquarters and Lawnscapings Challenges. So cute! Love the patterned paper and color combination! Chari, this card is just too adorable! Love the touch of vellum too!